“In today’s world, for a sick child, going viral can mean the difference between life or death.” How GoFundMe has become the last hope for many Americans. This essay makes a well-researched argument for why Fortnite is uniquely positioned to be the start of the Metaverse. If you’re like me and haven’t been paying much attention to the game, this is an excellent primer on its history and cultural importance. 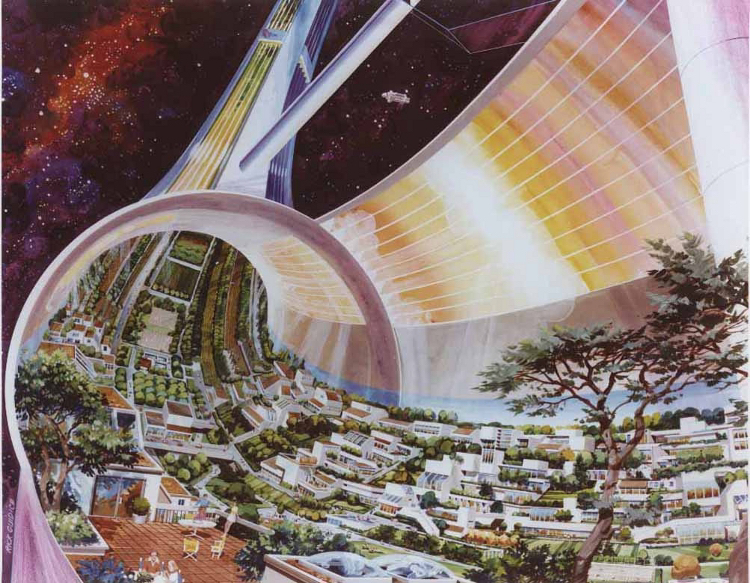 Oh wow, these examples of space colony art from the 1970s are awesome. “Pharmaceutical and biotech companies and health startups see the opportunity Instagram presents and are increasingly using influencer-advertising as a way to increase their bottom lines.” These stories are awful, and also not unexpected at all. ”Across countries, the intensity of parenting lines up very closely with economic inequality,” said Doepke. Parents get more intense as a country gets more unequal over time, and grow more permissive if the country gets more equal. A better approach, according to experts like Hornik, would be to teach kids at a young age the skills of lateral learning, including how to “interrogate information instead of simply consuming it,” “verify information before sharing it,” “reject rank and popularity as a proxy for reliability,” “understand that the sender of information is often not its source,” and “acknowledge the implicit prejudices we all carry.” Anything short of that is a waste of time and resources. We can all learn from this process, I think. The Republic of Newsletters and the Isles of Blogging, my friend. That’s what’s left. Messages in bottles from hermit caves by the sea. Writing for Psychology Today in 2014, Theresa DiDonato, a social psychologist at Loyola University Maryland, said that constant texting can lead to ‘a cycle of mobile relationship maintenance’, in which ‘individuals begin to feel an overdependence’, potentially violating your sense of privacy and autonomy. The otherwise innocuous act of texting can then strain close bonds between loved ones, and even create feelings of resentment toward people who are probably well-intentioned, but unaware of the toll of their excessive communications on your psyche. So this was an interesting find today. It is, as best I can tell, an original pressing (Discogs release #10900025 if anyone wants to check my work). It’s not a Blakey album I was familiar with, but I had a quick listen and loved it. Hidden gem for sure. Anyway, the vinyl didn’t look to be in great condition. So I talked them down (a lot), gave it a good wash (3 times), and am now listening through it. Not gonna lie, it’s not the quietest record I own. But I feel like it’s pretty good for something that was made in 1967 and has obviously been played a lot. Pretty sure I can sell it for 3x what I bought it for. But not this time. This is not an easy record to come by. So I’m hanging on for dear life to this piece of history. This Quartz deep-dive on the drum beat known as the “Purdie Shuffle” is amazing and now I’m hearing it absolutely everywhere.